This article is a complete guide to help you with deleting all your navigational history from Google servers. 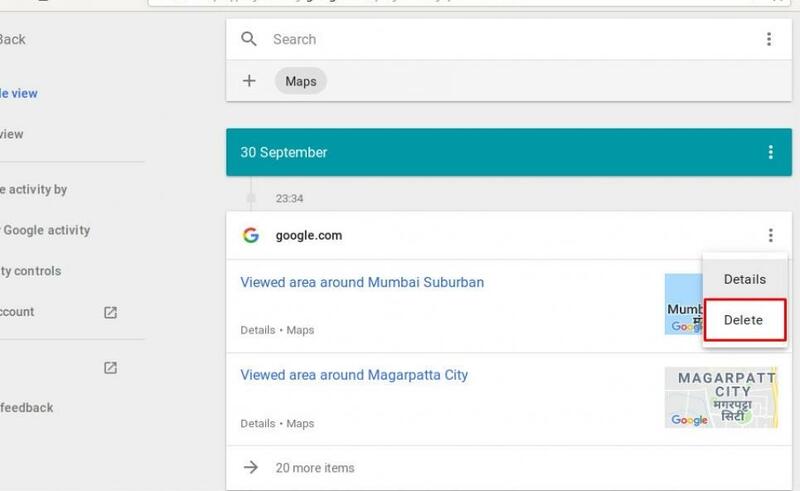 Know how you can use the Google Map or Google MyActivity page to delete the history of a particular trip you took or to delete all the location history that Google has on you. When you keep your location setting ON or when you use Google Maps, you are letting Google make a map of all places you have been. If that makes you uneasy, worry not, because removing this history is easy enough. You can remove the data of a particular journey or delete your travel history of a full day or of a whole year and more. 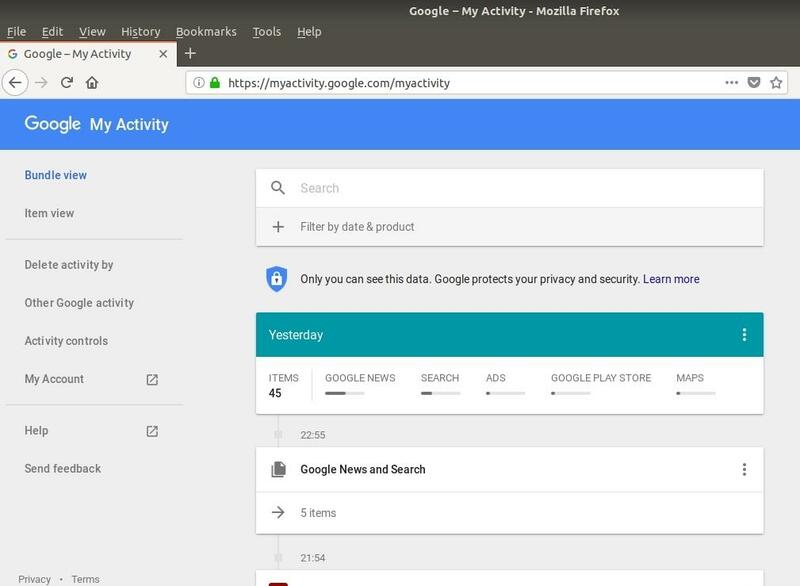 To do so, first we will be using Google Maps app and then the MyActivity (https://myactivity.google.com/myactivity) page of Google. Deleting your Google Map navigation history directly from the app is much simpler than from the webpage. It even has an option to delete all your location history that is associated with your email account with which you have signed on to the Google Map application. Let us start with deleting individual location history and will end with deleting all the location history. To delete the navigation history of a particular trip your took on a single day, open your Google Maps app, open the left side menu using the 3 dashed button the search bar at the top left, click on Timeline. Use the Calendar icon to go to that date when you took did the journey. The journey summary should now be visible on the screen, click on the particular journey and it will give you two options - Details and Edit. On the same page in the top right, you should be able to see a Dustbin icon. Click on that to delete this particular navigation history. Open the Timeline section on Google Maps and go to that particular day using the Calender widget. 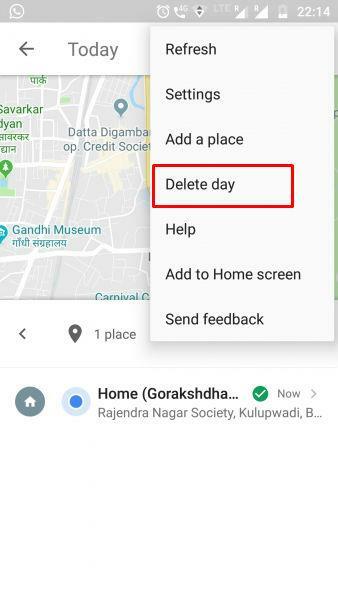 From the top left corner, click on the 3 dot button and in the menu that opens, select Delete Day to delete all navigational history in Google Maps for that particular day. Google is bound by law to provide you full control over your personal data and this includes your navigation data. If you want you can remove all your location history that is stored with Google or for a particular date range. To do this, open the left menu from the Google Maps homepage, click on Settings. 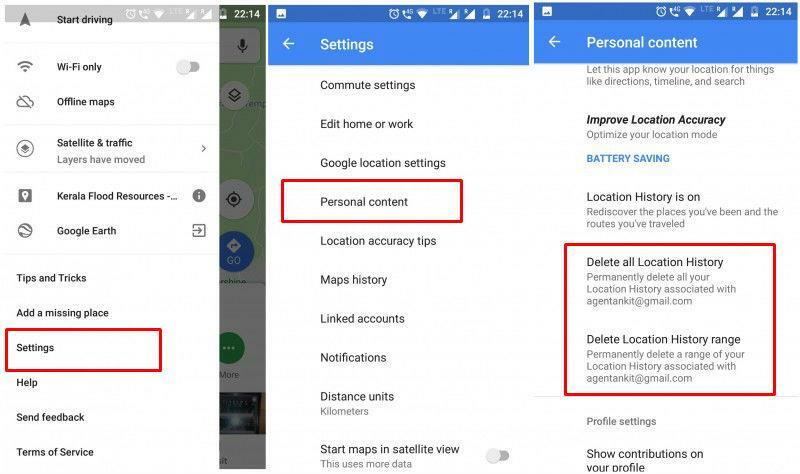 From there scroll down and you will find an option Personal Content, select that and you should be able to see two options - Delete all Location History and Delete Location History range. Use either of the options according to your requirements. If you are not signed in, make sure to sign in using the same Google account that you are using for your Android phone. You can open this page in either your smartphone or on your desktop. We will be using our desktop for the purpose of this article. On the page, you will be able to see all your Google apps activity history. To narrow down on the Maps activity, we need to use the Filter option to select Maps. Click on "Filter by date & product" and in the product list select the Maps checkbox. 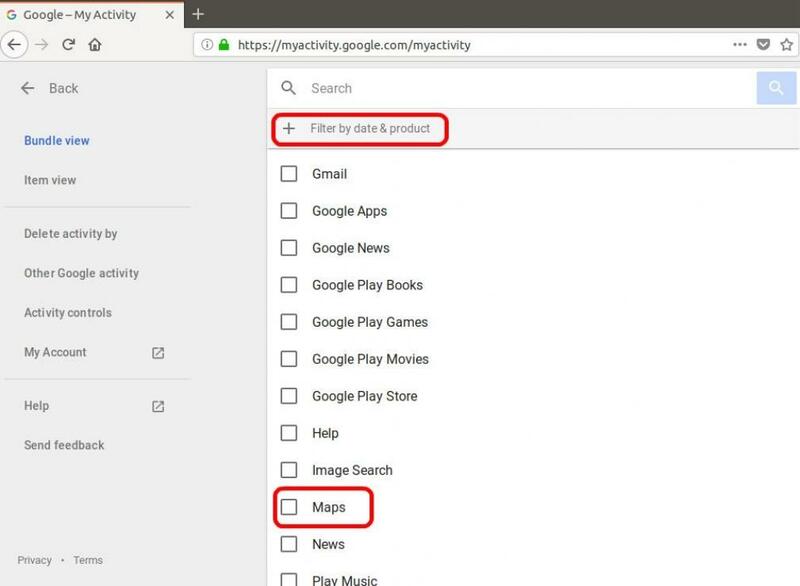 Once you have identified the Google Map activity to delete, click on the 3 dotted button to open the menu options and select Delete to delete the activity. 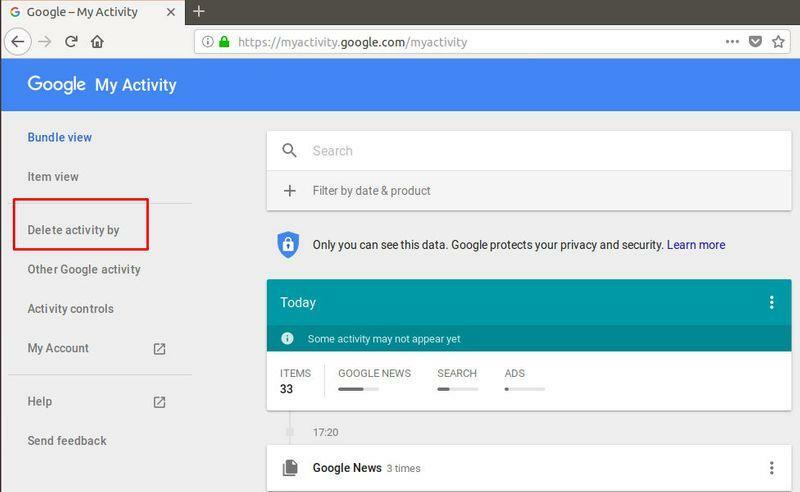 When you use the filter on Google MyActivity page, the historical activities are separated by their dates in addition to showing individual history details. You can use the bar showing the date to delete Google Map navigational history for a whole day using the date bar. To do so, click on the 3 dotted button present on the date bar and use the Delete option to delete all activities for that particular day. You can also delete your Google Map navigational history by selecting a particular date range. To do so, use the Delete activity by option in the left sidebar. In the next page select last n number of days for which you want to delete the history for. For instance, if there a week-long trip on which you used Google Maps but don't want anybody to know about while accidentally checking your Google Maps history, select "Last 7 days" from the drop-down. 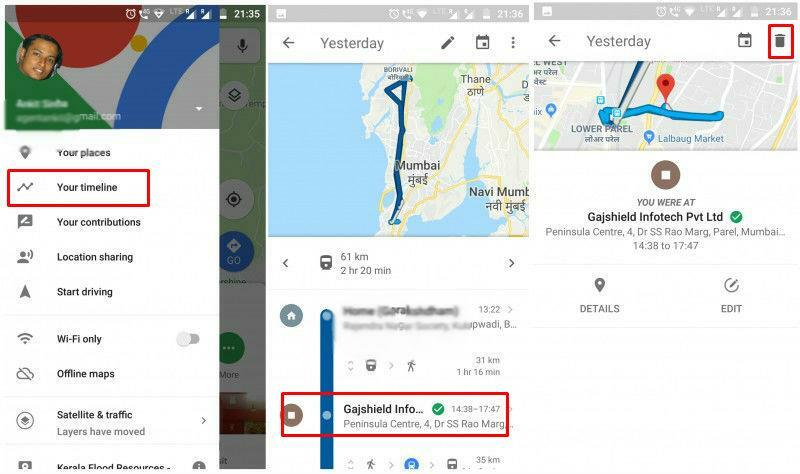 If the trip was taken sometime back or doesn't fit into the 7 or 30 range of days, you can also specify the exact start and end days for which you want to delete the Google Map navigation history. Just make sure you have select "Maps" from the last drop-down which contains the product detail for which you want to delete the history of. 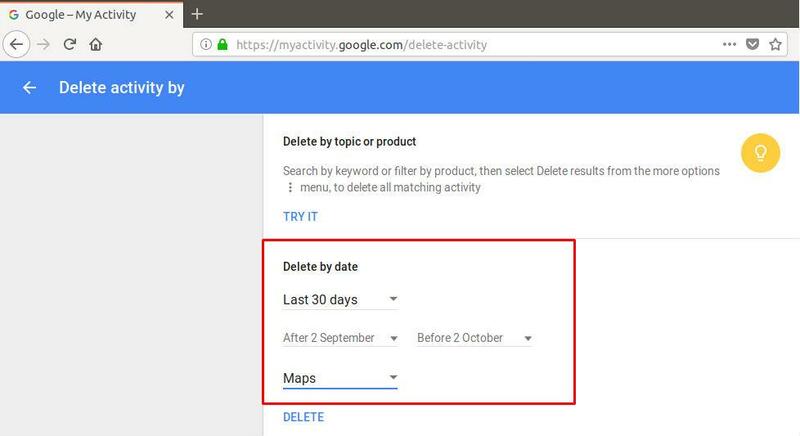 The last option can be used to delete all your navigational history on Google Maps by selecting a date range that spans all the years since when you have been using Google Maps. This data is used by Google to provide you with better services by way of advertisements. Many of us might consider this an invasion of privacy but that is how Google is able to finance so many services for free. If you want to delete this data, you have all the tools available to you both from the app as well as from the webpage. Do let us know if you face any problem in deleting your navigation history from Google Maps or if you have any other questions.